Introduction: Thyroid lesions are reputed to be the second most common of all endocrine lesions (next to diabetes mellitus) and thyroid cancer is reported to be the 16th commonest cancer globally. This study reviewed the spectrum and scope of thyroid lesions encountered in a tertiary hospital in Nigeria over a decade. Setting: National Hospital Abuja (NHA) is a 450-bed tertiary public hospital located in the cosmopolitan city of Abuja the capital of Nigeria. Materials and Methods: This is a retrospective analytic study involving the entire thyroid specimen received in the department of histopathology from 1st January 2007 to 31st December 2016. Results: Our study demonstrated that thyroid pathologies are commoner in females than males with a ratio of 6:1. Papillary thyroid carcinoma and follicular adenoma are the commonest malignant and benign tumours respectively. Conclusion: Thyroid diseases are common cause of morbidity in our environment. The commonest malignant thyroid disease in NHA is the papillary carcinoma. Thyroid diseases are reputed to be the second most common of all endocrine lesions (next to diabetes mellitus), and thyroid cancer is reported to be the 16th most common cancer globally. Indeed, these lesions are significant cause of morbidity and hospital attendance in both iodine-replete populations and in communities with goitrogenic agents like some areas in Southwestern Nigeria. Furthermore, both developed and developing countries are suffering from the malignant component of this scourge. There is insufficient information on thyroid diseases from African countries despite an upsurge in reported cases in the 1970s. The National Hospital Abuja (NHA) is a 450-bed tertiary public hospital located in the cosmopolitan city of Abuja, the capital of Nigeria. The Federal Capital Territory is located in the geographical center of Nigeria with a land area of almost 8000 km2 within latitudes 70 20′ north of the equator and longitudes 60 45′ and 70 39′ (Demographia, 2015). Population of Abuja is estimated to be approximately 2 million. The NHA derives clientele mostly from the inhabitant of the federal capital and surrounding states of the federation as well as referrals from other geographically distant states. This is the first study on thyroid lesions emanating from the NHA. This study reviewed the spectrum and scope of thyroid lesions encountered in a tertiary hospital in Nigeria over a decade. This was a retrospective, descriptive study of all thyroid specimens received in the department of histopathology from January 1, 2007, to December 31, 2016. Patients' biodata were obtained from the departmental daily register and supplemented with data from the institutional database. Slides were retrieved from the departmental archives and reviewed, where appropriate, new slides were made from archived tissue blocks. Thyroid specimens used in the study were obtained from surgical procedures including thyroidectomies, lumpectomies, and trucut biopsies and such specimens were routinely processed, and the slides stained with hematoxylin and eosin for assessment by the histopathologist. Occasionally, ancillary investigations such as special stains, immunohistochemistry, and molecular pathology studies are necessary to arrive at a final diagnosis. Samples with insufficient clinical history or whose slides and/or blocks are lost were excluded from the study. During the study period, a total of 282 thyroid specimens out of a total of 19,610 surgical specimens received by the histopathology department and this represented 1.4% of the total samples. Nineteen thyroid samples (6.7%) were deemed inadequate due to insufficient data and/or lost slides and were excluded from the study. Of the remaining 263 cases used in the study, 227 (86.3%) were females and the remaining were males with a female-to-male ratio of 6:1. Furthermore, a gradual but sustained increase in thyroid samples was observed over the years. This is depicted in [Figure 1]. The age range of patients is from 9 to 78 years with a mean of affectation 41 ± 13.2 years. 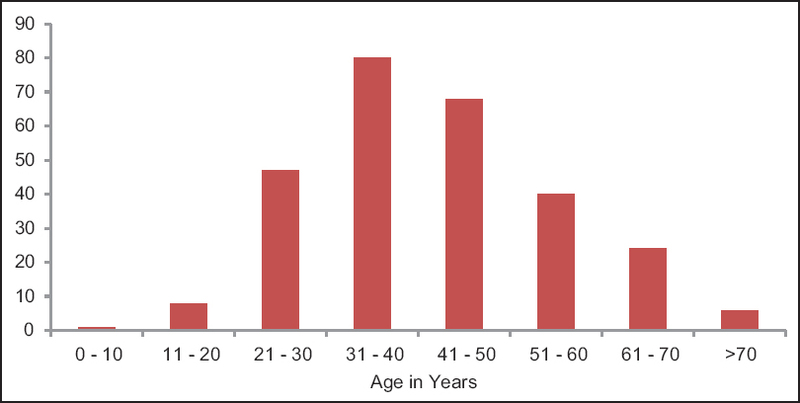 The most affected age groups are 31–40 years followed closely by the 41– 50-year cohort [Figure 2]. The most common thyroid lesion encountered is the goiter (both simple and multinodular) accounting for more than half (n = 159, 60.5%) of the total thyroid lesions. Neoplastic lesions constitute over 30% (81 cases) of the thyroid lesions while inflammatory diseases accounted for 11 cases (4%). Histologically malignant lesions (n = 53, 65.4%) constitute majority of the neoplastic cases with papillary thyroid carcinoma (n = 23, 28.4%) being the most common. Follicular adenoma (n = 11, 13.6%) is the predominant benign lesion seen. This is presented in [Table 1]. The prevalence of thyroid diseases obtained in our study (263, 1.4%) is significantly less than reported by Raphael et al. (522,%) in North-western Nigeria and more than figures obtained by Salami et al. (175) from the Southwest region of the country. Our result, however, compares favorably with that reported by Nggada et al. (274) also from southwestern Nigeria. This may further give credence to the notion that thyroid lesions are significantly associated with socioeconomic and geographical factors particularly diet and environmental influence. This study showed that, for both malignant and benign lesions, in our study, multinodular goiter had the highest frequency and this accounts for the largest proportion of the lesions as observed by other workers as well reported in several literatures. Among the neoplastic lesions, however, papillary thyroid carcinoma represents the most common malignancy followed by follicular carcinoma. This agrees with the findings of a similar study by Thomas and Ogunbiyi in Ibadan but contrast with that of Edino in Kano, Abdulkareem in Lagos, and Nggada in Maiduguri who reported predominance of follicular carcinoma. Cases of poorly differentiated, anaplastic, and medullary carcinomas were also encountered [Table 1] similar to reports from Kano11 and other centers. 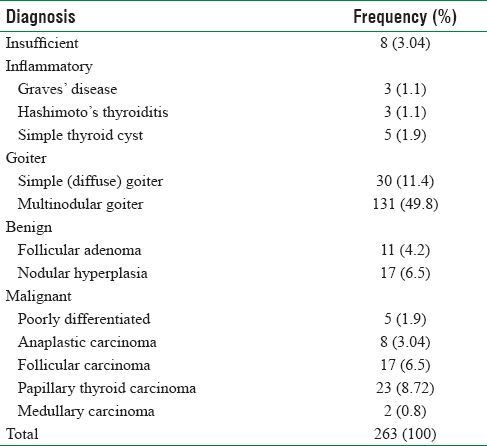 Similar to report from most centers in Nigeria, follicular adenoma was the most common benign neoplastic thyroid lesion encountered in this study. Mortality from thyroid malignancies is a topical issue generating intense discussions. Thyroid cancer mortality in the UK is said to be <1% of the total cancer death and has significantly decreased by about 46% over four decades. The thyroid mortality trend in Nigeria and other African countries is currently unclear due mainly to paucity of reported data. Thyroid diseases are important contributors to morbidity in our environment and exhibit significant female predilection. Goiters are the predominant disorders of the thyroid, and papillary thyroid carcinoma is the most common malignancy. A review of the time trend of the prevalence of thyroid disorders is advisable to detect any upward tendency for initiation of mass screening programs. Ferlay J, Soerjomataram I, Dikshit R, Eser S, Mathers C, Rebelo M et al. GLOBOCAN 2012 v1.0, Cancer Incidence and Mortality Worldwide: IARC Cancer Base No. 11. Lyon, France: International Agency for Research on Cancer; 2013. Available from: http://www.globocan.iarc.fr (linkisexternal). [Last accessed on 2013 Dec 28]. Ojule AC, Osotimehin BO. Maternal and neonatal thyroid status in Saki, Nigeria. Afr J Med Med Sci 1998;27:57-61. Ogbera AO, Fasanmade O, Adediran O. Pattern of thyroid disorders in the Southwestern region of Nigeria. Ethn Dis 2007;17:327-30. Raphael S, Mohammed AZ, Iliyasu Y. Histological pattern of thyroid gland neoplasms in Kano, Northern Nigeria. Niger J Med 2015;24:5-11. Salami BA, Odusan O, Ebili HO, Akintola PA. Spectrum and prevalence of thyroid diseases seen at a tertiary health facility in Sagamu, South-West Nigeria. Niger Postgrad Med J 2016;23:137-40. Nggada HA, Ojo OS, Adelusola KO. A histopathological analysis of thyroid diseases in Ile-Ife, Nigeria. A review of 274 cases. Niger Postgrad Med J 2008;15:47-51. Kpolugbo J, Uhumwangho O, Obasikene G, Alili U. Blood transfusion, antibiotics use, and surgery outcome in thyroid surgery: Experience from a suburban center in Nigeria. Niger J Clin Pract 2012;15:458-61. Sidibé el H. Thyroid diseases in sub-saharan Africa. Sante 2007;17:33-9. Šafránek J, Třeška V, Skalický T, Špidlen V, Doležal J, Kubačková D, et al. Thyroid carcinoma, ten-years file. Rozhl Chir Fall; 95:394-7. Chereau N, Trésallet C, Noullet S, Godiris-Petit G, Tissier F, Leenhardt L, et al. Prognosis of papillary thyroid carcinoma in elderly patients after thyroid resection: A retrospective cohort analysis. Medicine (Baltimore) 2016;95:e5450. Ferlay J, Steliarova-Foucher E, Lortet-Tieulent J, Rosso S, Coebergh JW, Comber H, et al. Cancer incidence and mortality patterns in Europe: Estimates for 40 countries in 2012. Eur J Cancer 2013;49:1374-403. Thomas JO, Ogunbiyi JO. Thyroid cancers in Ibadan, Nigeria. East Afr Med J 1995;72:231-3. Edino ST, Mohammed AZ, Ochicha O, Malami SA, Yakubu AA. Thyroid cancers in nodular goiters in Kano, Nigeria. Niger J Clin Pract 2010;13:298-300. Abdulkareem FB, Banjo AA, Elesha SO. Histological review of thyroid lesions: A 13-year retrospective study (1989-2001). Niger Postgrad Med J 2005;12:210-4. Nzegwu MA, Gabriel E, Njeze D, Daniel B. Olusina B, Ugochukwu AI. A histological update of thyroid lesions in Enugu, Nigeria: A 5-year retrospective study. Asian J Exp Biol Sci 2010;1:1-5. Howlader N, Noone AM, Krapcho M, Miller D, Bishop K, Kosary CL, et al., editors. SEER Cancer Statistics Review 1975-2014. Bethesda, MD: National Cancer Institute 2017. Available from: https://www.seer.cancer.gov/csr/1975_2014/, based on November 2016 SEER data submission, posted to the SEER website. [Last accessed on 2017 Apr 21].